No reason for this post other than I haven't posted photos in awhile. Granted, the kids have been so sick that there haven't been the best photo opps. lately. 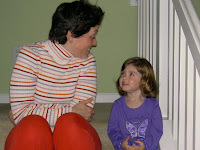 Nevertheless, I managed to catch a few cute moments between coughing fits. Enjoy. 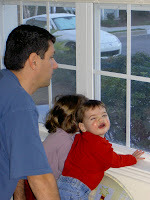 The kids' favorite thing to do on Thursday mornings is watch for "Stinky" the garbage truck. They LOVE the mechanical arm that lifts the trash cans. And I love the innocence of someone who is so easily impressed and amazed. Still fascinated by "Stinky", Nicky shows off his newfound skill of smiling for the camera. It's the cutest little toothless, squinty grin, and I LOVE it! Emma perched on the stairs just after her nightly bath. She's all coiffed and smelling nice, ready to be tucked in. I just love the way she smells and looks after her bath...all clean and rosy. 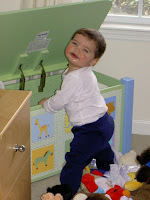 Nicky's other newfound favorite skill: loading and unloading the toy box while flashing that famous grin. He's so funny about smiling. If I come anywhere near him with the camera, he flashes his best smile. 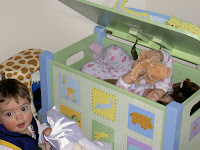 Yes, that's Emma IN the toy box. She got her whole self in there much to Nicky's chagrin. 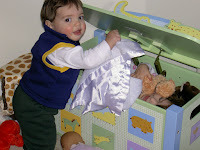 Nicky, unaffected by Emma, trying to load things in on top of his sister. 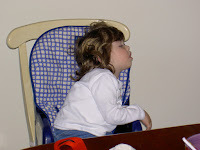 Finally, this is Emma totally passed out in her booster chair after a night of coughing fits which kept her up from 2am on. Mind you, not 15 minutes earlier when I told her it was time to take a nap, she pleaded with me to stay up and have a quick snack because she was SOOOOO hungry. So, I agreed to forgo the nap for 15 minutes in the interest of satisfying her hunger. She never even got the food into her mouth.